I think I started painting my nails when I was 14 but I wasn't very good at it so I rarely did it. I started getting a little bit more practice at 18 and since then having nail polish on is a must. My hands feel naked without it! I don't do nail art very often because it's quite time consuming, but when I do it's always something simple like this ruffian manicure. First I used two coats of Catrice In The Bronx nail polish, making sure it was fully opaque close to my cuticles, and waited for it to dry. Then I put some french tip guides close to my cuticles, covering part of the bronze, and I painted the rest of my nails with Essence Multi Dimension Fatal nail polish, a good basic black shade. After that I just removed the guides and applied my favourite top coat which is Essence Better Than Gel Nails Top Sealer. Most of my inspiration comes from the blogosphere. My favourite nail trends are definitely metallic nails, french manicure with black tips, matte nail polish and, of course, the ruffian manicure. 4. 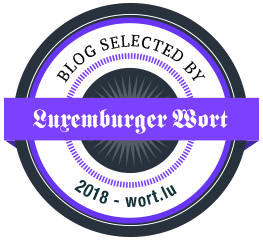 Please share the link to your blog and tell us what you´re blogging about. You can find me at www.inespaul.blogspot.com. My blog is mainly about beauty but it also has some fashion bits. I post reviews, comparisons, hauls, makeup & outfit of the day, favourites, manicures, empties and all that good stuff! Thanks Inês for being a part of my readers' manicure program! What I really like about this manicure is how neat is has been applied, how easy but yet gorgeous the idea is and how good the nail polishes match. Now you guys should definitely take a look at Inês' blog as her posts are really high quality and she deserves to have way more followers than she currently has! If you want to submit your manicure or just write a manicure related post on my blog (or even just introduce a gorgeous new nail polish), you can enter here. What do you guys think about Inês' manicure? Have you tried something similar with other shades? 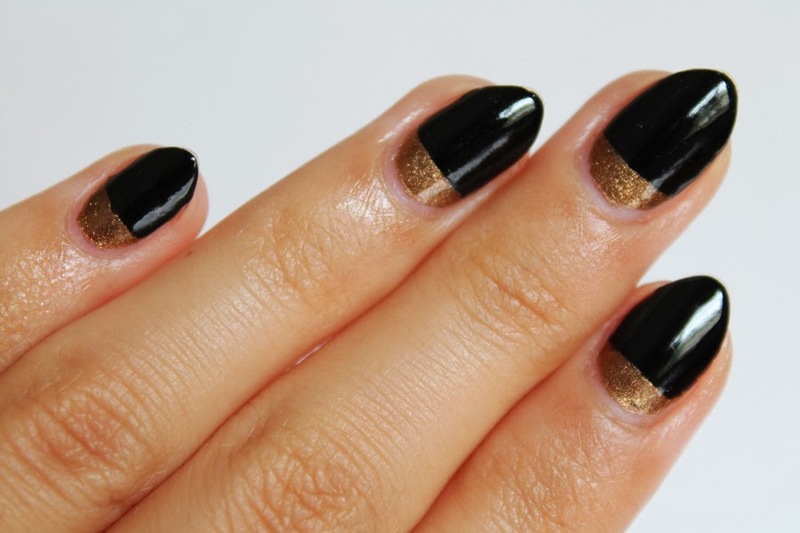 I really like the glam goth appeal of this manicure, a stunning colour contrast, looks lovely! May your week get off to a great start! Ganz tolle Nailart! 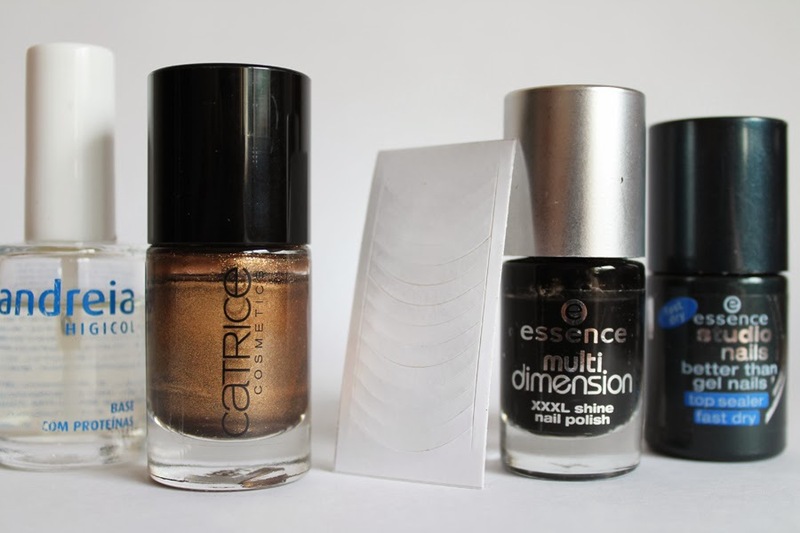 Den goldenen Lack von Catrice hab ich auch. Die Maniküre oben finde ich auch ganz super, hat Ines wirklich super sauber hingekriegt! Sowas könnte ich ja nie! Ich glaube, goldener Lack wandert nächstes Mal mit ins Einkaufskörbchen. This is a very nice idea! Looks great! A very nice mani, I like the contrast! Ok I just saved this. I LOVE it! I'm usually not a fan of manicures or even curating to my nails, but I love black nailpolish, and this is so freaking awesome!! A very classy manicure! I also feel naked when I don't have my nails done. Gefällt mir sehr gut. Ines hat es echt drauf! Super Idee und sieht echt cool aus. 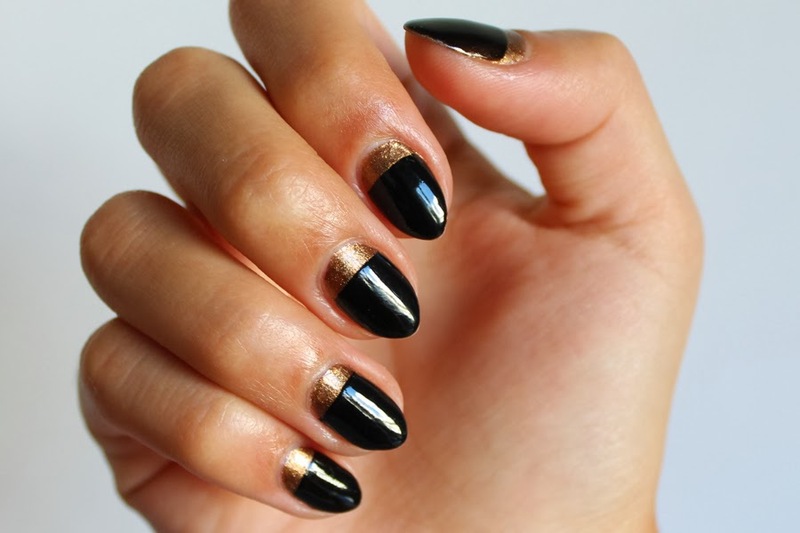 I think I should be able to accomplish this design with my lousy manicure skills! This is beautiful!